You have heard me report on these when they were announced at the IPCPR, you have seen me smoke a few, perhaps you were at an event where I donated a bundle to give away. 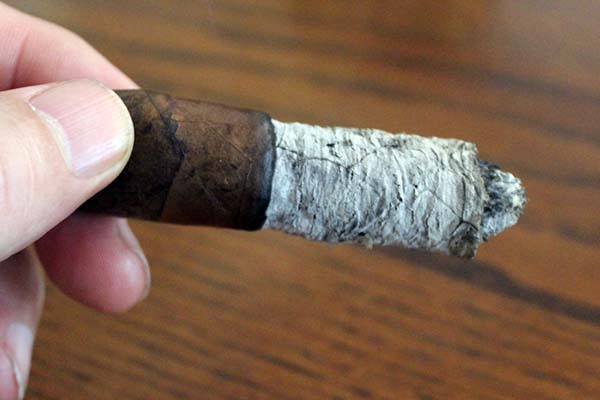 We are talking about the Southern Draw Cigars – 300 Manos (Hands). It is time to talk more deeply about this fine cigar and remind you all of the charitable story behind it. 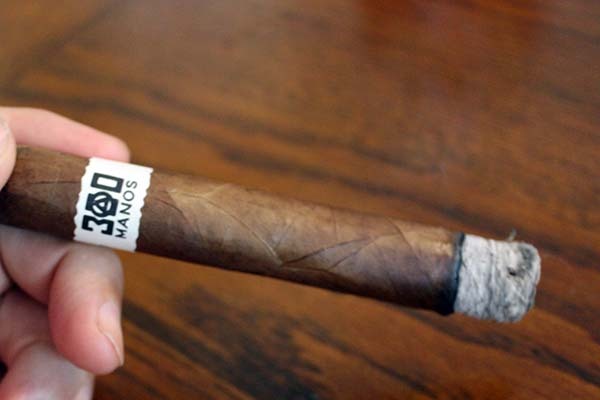 If you recall, Southern Draw Cigars had two big announcements at last years IPCPR. The first was the introduction of the Cedrus Cigar and the second was the release of what is called the 300 Manos (Hands) which is a way for Southern Draw Cigars to give back to the many Nicaraguan men and women in the cigar industry. You see, Robert and Sharon Holt, the owners of Southern Draw Cigars believe deeply in giving back to community. 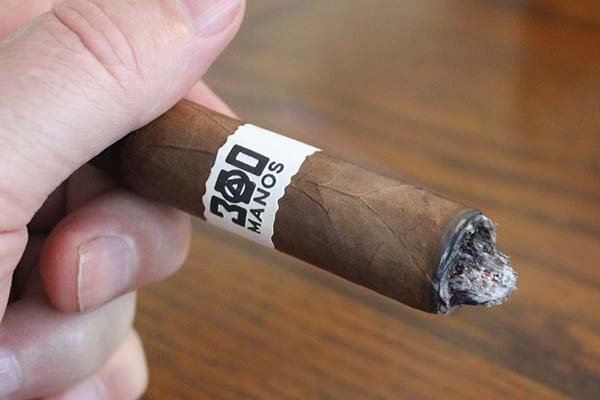 The 300 Manos (Hands) is a not just a tribute to the 300 sets of hands that touch the product you are smoking right now, but it is a way to take the profits and help those in need in Nicaragua. Now one may think such help goes directly to workers in the factory, farms, or processing facilities, but we would all be incorrect. The 300 hands project started with Robert and Sharon asking the workers how Southern Draw could help them. The company received stacks of hand written letters and not one of them asked for anything for themselves. Instead, the letters asked for assistance for such things as new pews in church, help for an elderly lady up the road, or assistance for medical bills for a friend or neighbor. The responses were beyond heart warming. Robert and Sharon read every letter, many times with tears in their eyes, and realized they were being called to do something. They decided that the 300 hands project should be launched, but not without the assistance of the factory and distribution. The Southern Draw Cigars team was able to negotiate lower production and distribution costs on the line and offer a high quality cigar to the consumer that would generate assistance to the many who wrote those letters. Each bundle of cigars come with a baseball like card in it, featuring a worker who had their hands in the process of getting that cigar to you. So when you enjoy your moment you will know the profits went to help another. Both blends are artfully constructed at the AJ Fernandez Cigar Co. in Esteli, Nicaragua and are available in 5 different vitolas and come packaged in 10-count bundles. The Southern Draw 300 Manos Habano Piramides is a glistening, medium tan, habano wrapped cigar. It is silky smooth to the touch with minimal veins invisible seams. The cap is perfectly applied. This is a well constructed cigar. Oh yea – remember the price point $6.40/cigar. There is one band that adorns the cigar. 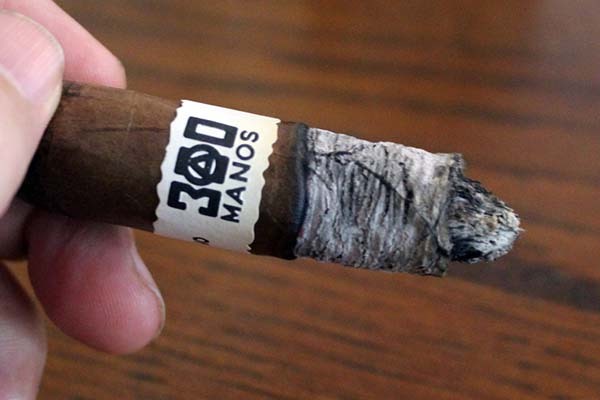 In the case of the Habano 300 Manos it is a white band with the phrase “300 Manos” printed in black on the front and the word Habano on the side along with a silhouette of Nicaragua and the phrase “Puros De Nicaragua” (Nicaraguan Puro). The pre-light aromas included a hearty fermented leaf note along the barrel and an earthy and citrus foot. I sliced the cap like i would do a torpedo, cutting it at a 45 degree angle about an 1/4 inch down from the point. The cold draw restriction was just to my liking and offered notes of earth and a touch of sweetness. I have smoked a few of these and found that if you just roll it about and cold puff on it a bit more, the natural tobacco sweetness grows on the palate. But like all cigars, they are made to smoke, so it was time to ignite this one up and burn it to ash. Oils are developing well above the char line – this is a $6.30 cigar? 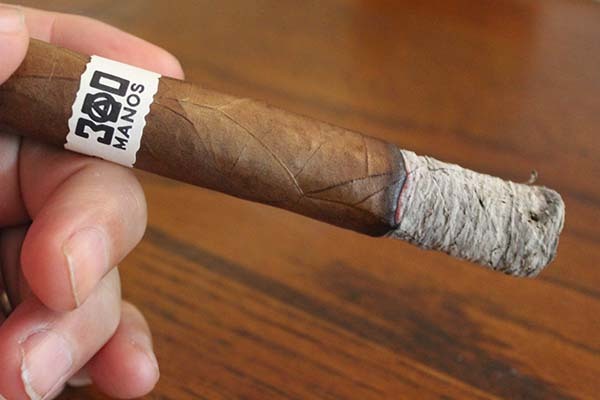 Overall, the Southern Draw Cigars 300 Manos Piramides was a spectacular cigar that is certainly worth buying bundle of, especially when you consider that the proceeds help those in need in Nicaragua. This is a cigar that is worth every penny and more with its rich flavor profile and fine burn qualities. There were a few issues with a pointed burn cone and the cigar burning hot to the touch in the final. There was also some midpoint sour notes but all in all I rate this a 92. 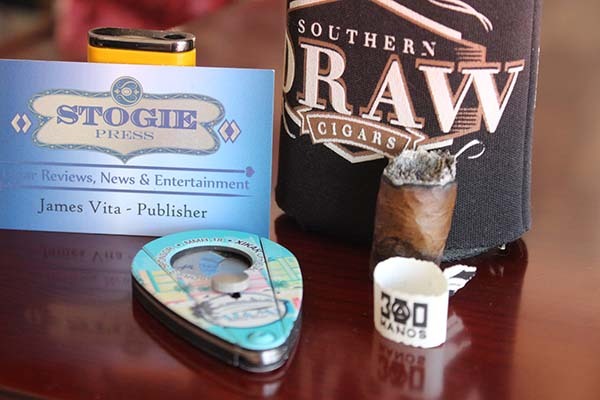 This entry was posted in Cigar Review, Southern Draw and tagged AJ Fernandez, cigar review, IPCPR 2018, Southern Draw 300 Manos Habano Piramides, Southern Draw Cigars. Bookmark the permalink.